Whilst out shopping today, I noticed (and indeed bought) TV Film Memorabilia magazine, which claims to be a publication for ‘fans of TV, film & collectables from the 1960s to the present day’. And while not everything in there appeals, it’s certainly worth a browse, especially for fans of 60s TV. 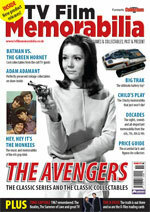 The current issue includes an extensive feature on The Avengers (and classic collectables and merchandise), vintage tie-ins from Adam Adamant, Monkees memorabilia, Batman vs The Green Hornet, a feature on 1967 and various buyer’s guides for vintage items. It does occasionally go a bit too sci-fi geek for my own tastes (and there’s the worry that future issues might go a little too far that way), but this first issue is certainly worth a look in your local newsagents. It retails for £3.